When the warm sunny days disappear, and cold & wet weather starts to take over, you don’t have to be made of steel & stone to carry on riding your bike through it all. You just have to be prepared! We’ll show you how. By wearing the correct clothing in autumn and winter, your cycling days can continue throughout the year. Wind, rain and cold are guaranteed features at this time of the year, so dress up well with a layered clothing designed for use by cyclists. Cycling jackets and other upper body cycle clothing will include features like dropped rear hems and rear pockets. These give you extra coverage lower down your back and bottom where water spray causes the most grief, with rear pockets giving you the carrying space you need in a place where it won’t bunch up and interfere with your legs. Regular wind & waterproof gloves may be great if you’re waiting for a bus in the rain, but if they don’t have the flexibility, padding and grip of a cycling glove, they won’t be much use while you’re riding your bike. The material, unlike that of a cotton t-shirt, helps to wick moisture away from the skin as well, keeping you dry. Base layers are available in many different styles. Both short- and long-sleeve versions of the upper body base layers are available and, for the short sleeve ones, arm warmers can be purchased, which can easily be applied and removed as and when required. For the lower body, base layers are available as leggings or leg warmers. A variety of jerseys are available in different thicknesses and types of materials. As with the base layer, their function is to remove any sweat and moisture from the skin. Middle layers also come in short and long-sleeve options, and can often be worn as a single or outer layer during the warm, summer months. Windproof, waterproof, lightweight and breathable. This is your jacket, and for cycling its main function is to keep the elements out, while letting your skin breathe. Thick & heavy jackets aren’t very suitable for cycling, as they will over-insulate and keep you too warm & sweaty. At one end of the scale, jackets can be multi-functional with pockets, hoods and reflectives. At the other, they can be ultra-lightweight and packable so that you can fit them in your pocket. Depending on the severity of the weather and how strenuous your cycling will be, cycling jackets are available in a wide range of options to suit every need. It is likely that you may find yourself riding in dark or dull lighting conditions. In these circumstances, it is recommended that your outer layer has reflective areas to help other road users see you more clearly. Keeping your legs warm whilst cycling is surprisingly easy. Because they’re doing most of the work, they will tend to keep themselves warm, unless you stop pedalling. Tights and leg warmers are available to give you a boost. Worn against the skin, like a base layer, tights will insulate your legs right at the surface where the heat is lost. You can opt for thermal merino tights, or lighter weight non-thermal tights. A common question regarding bib tights is how to wear the bib straps – should they go under or over your base layer? Bib straps should be worn on top of your base layer for the best effect. By using bib straps instead of a waist band, and placing the straps on top of your base layer, your waistline won’t feel uncomfortable and restricted by the pressure of your clothing. If your hands get cold, operating the gears, brakes and steering can become painful, and as your hands can’t move as fast your reaction times may be slower. They play a vital role in controlling your bike, but unlike your legs, they aren’t constantly moving and don’t tend to keep themselves warm. During the Winter, it is highly recommended that you wear wind & waterproof full-finger gloves to keep your hands warm and dry all over. In sub-zero temperatures you may need gloves with added thermal insulation too. The SealSkinz Halo cycling gloves come highly recommended, thanks to their thermal insulation, comfortable padding, ultra-grippy palm & finger tips, plus they have in-built LED lighting on the rear to help when indicating direction changes at night. Puddles are your feet’s worst nightmare when riding in the rain. Even the most effective mudguards can have a tough time keeping puddle splashes from soaking your feet. Waterproof overshoes are a real lifesaver if you commute by bike during the Autumn/winter months. 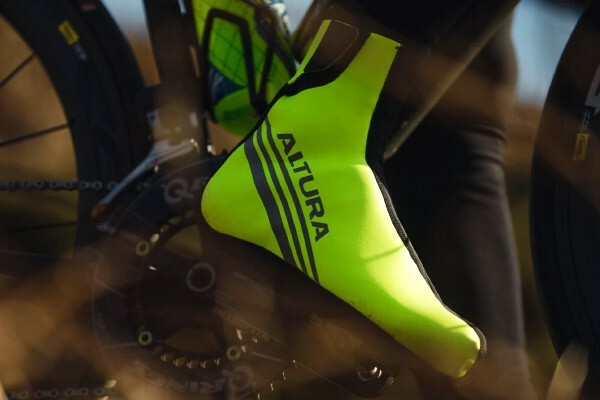 Overshoes come in varying degrees of thermal insulation, from those which are simply water resistant, to others which have a fleece lining for added warmth. The SealSkinz Halo overshoes also feature built-in rear afcing LED’s to help improve your night time visibility too. Last, but not least. Keeping your head warm and dry will have a dramatic effect on your ability to ride a bike. As much as anything, if you’ve got water dripping down your cheeks and your ears are freezing cold, your mood will suffer tremendously. Scull caps can be worn underneath your helmet, and a versatile multitube/neckwarmer can be used to protect your ears, mouth and neck from the elements.